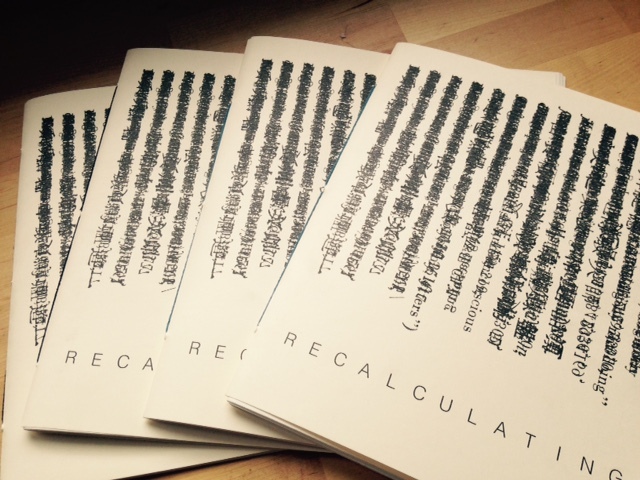 Index/Fist, the creative collective I co-founded, just released its latest zine, “Recalculating.” This is a collection of geography/cartography-themed work with more than 20 contributors from the East Coast to the East Bay. We solicited contributions of prose, poetry, and art from talented friends we knew, organized them in a coherent narrative, had them printed on a Risograph via Tiny Splendor, hand-sewed 150+ zines in my living room, and celebrated the release at the East Bay Moishe House, a Jewish communal house in Oakland, CA. If you’d like a copy of the zine, we’d love to send you one! Send $5 per zine + $1 for shipping to carolinehkessler [at] gmail [dot] com via Paypal or Venmo. Put your address in the notes section. Or email me about how to send a check. Local delivery to the East Bay or San Francisco. This iteration of Index/Fist is me and fiction writer David Wesley Green. Layout by Sumeet Banerji, author of Ice Party.